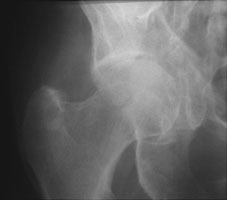 Acetabular fractures are usually the result of major direct trauma to the pelvis and femur. The acetabulum may be classified into the anterior (iliopubic) column, the posterior (ilioischial) column, and the dome of the acetabulum. Posterior wall fracture is usually the result of posterior hip dislocation. A AP radiograph of the right hip. 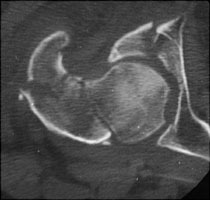 This shows a comminuted fracture of the acetabulum. 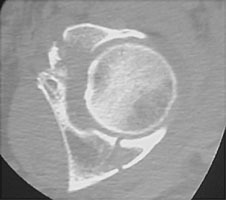 B Axial CT. This demonstrates a fracture of the neck of the femur and the anterior column of the acetabulum. C Axial CT. This image from a different patient shows fractures of both columns of the acetabulum.